The dedicated volunteers of Northwest German Shepherd Rescue pride ourselves on finding the best homes possible for the German Shepherds in our care. We work very hard to match our dogs with potential adopters based on the adopter’s lifestyle and expectations, and the dog's characteristics and personality. Naturally, our goal is for every one of the rescue dogs we place to remain in their new homes for the rest of their lives, with a lifetime of love and happiness for both the pet and the adopter. To ensure that we make the best matches, we have developed a process that has proven very effective in determining the best homes for our animals. Our adoption process may seem time consuming or complicated, but please understand that we have the best interests of both our dogs and our adopters at heart. We work hard to find the best homes possible for our dogs, as well as to find the right dog for you and your lifestyle. Our organization is completely run by volunteers, who dedicate their free time to help make this process a success. We thank you for your time, patience and commitment to our process of making a great match for both you and your new companion. Please be aware that the rescue has a general policy that our German Shepherds will not be adopted to owners who currently have dogs weighing less than 20 pounds. By nature, German Shepherds have an extraordinarily high herding/prey drive, and this policy has been established for the safety of small breed dogs. Only in special circumstances will exceptions be made to this policy. NWGSR does not adopt any of our dogs to homes with children under the age of 8 years old unless both the child and parent/guardian have German Shepherd or similar breed experience. We also require that all homes have a fully-fenced yard, a minimum of 5' tall. Step 2 – Application Preliminary Review - Our volunteers will initially screen your application to determine if all necessary information was provided. If your application is incomplete, you will be contacted to provide additional information. Step 3 – Landlord Approval Verified - If you rent your home, your landlord will be contacted to make sure that you have approval to have a dog in your home. We also ask about any breed or size limitations. Step 4 – Veterinary References - Our volunteers will contact the veterinary reference(s) you provided to determine if all your current pets are spayed/neutered and up-to-date on vaccinations. If you don’t have any current pets, we will ask about the veterinary care that your previous pets received. If your veterinary reference(s) cannot verify the spay/neuter and vaccination status of current or previous pets, processing of your application will be stopped until this information is provided. Step 5 – Personal References - Our volunteers will contact your two personal references and ask them questions about whether they consider you to be a responsible pet owner. This is the portion of the process that can take the most amount of time. It is helpful if you contact your references ahead of time and let them know that we will be calling so they can respond in a timely fashion. If our volunteers have any major concerns about adopting a dog to you based on communication with your references, your application may be denied at this point in the process. Step 6 – Applicant Interview - Your application will then be assigned to an adoption counselor who will contact you for a phone interview. You can expect to spend 10-25 minutes on the phone with the adoption counselor. The adoption counselor will ask more detailed questions about your application, or may ask you to explain some areas of your application in more depth. Again, this is a chance for us to get to know you, and what your ideal future German Shepherd family member would be like. Step 7 – Home Visit - NWGSR requires home visits to determine that the dog will be living in a safe environment. This is another opportunity for us to get to know you, your lifestyle and your home environment, and to determine which dog(s) in our program might be the best fit for you. The home visit volunteer will do a short walk-through of your home and yard to ensure its safety and to advise you on any areas of concern. All household members must be present for the home visit. This is a great opportunity for you to sit with a NWGSR representative and have any outstanding questions or concerns answered. If our home visit volunteers have any major concerns about your home environment, or if you refuse a home visit, your application will not be processed past this point. Please note: Distance is a factor in whether or not the required home visit can be completed. We are a 100% volunteer organization. Although we do have volunteer contacts throughout the region, in some areas it may be difficult for us to locate a volunteer to conduct the home visit. We will let you know ASAP if we are unable to complete the process, and will work with you to find an alternative. Step 8 – Meeting between Approved Applicant & Available Dog - Our dogs are cared for in loving, private foster homes. Out of respect for the privacy and safety concerns of our fosters, we do NOT arrange meetings between interested individuals and our fosters until an applicant has been approved as a potential adopter. Once you have been approved, a volunteer will contact you about scheduling a time for you to meet the dog(s) in which you have indicated interest. This meeting may occur at the foster home, at a neutral place, or at your home. If this initial meeting is in your home, please be advised that your potential dog may not be left with you at this time. You will be asked to bring all members of your family to the adoption appointment. This includes other dogs if you have them, as we will need to observe the interactions between the dogs and also all members of your family. You should plan on spending approximately one hour with the dog you may be adopting. Please come prepared with questions, and plan on getting down on the ground with the dog and spending time on a short walk. Allow time to observe the dog’s interactions with his/her foster family. German Shepherds are an aloof breed, not known for accepting strangers easily. What you observe of the dog with his/her foster family is similar to what you could expect of the dog with your family if you proceed to adopt. If you have already had an approved home visit, please bring any equipment necessary to safely transport the dog home if the adoption proceeds, such as a crate or a preferred style of leash or new collar. Although you may become an approved adopter, you are not guaranteed a particular dog. We receive many applications for some dogs, so we may allow multiple applicants to have a meeting with the dog before we identify the home that we believe will be the best fit for the dog and the adopter. Likewise, we will also allow and encourage applicants to meet more than one dog if we feel there are multiple potential matches. Please be assured that we will always keep your application on file if we do not have a dog that is an immediate match for you and your lifestyle, and will evaluate your file as a possible match for new German Shepherds that come into our rescue. Our goal is to get great dogs into great homes! Step 9 – Congratulations - Adoption Official! - If you and the dog's foster family feel you’ve found a match and decide to finalize the adoption, you will be asked to complete an adoption contract and to pay a non-refundable adoption fee prior to taking the dog home. Please review the contract carefully. Adoption fees are based on the dog's age and breed. This amount only partially covers the cost of veterinary care, boarding fees, and other miscellaneous expenses involved in the temporary care and adoption of our dogs. Prior to placement, all dogs are spayed or neutered, receive current vaccinations and are micro-chipped. 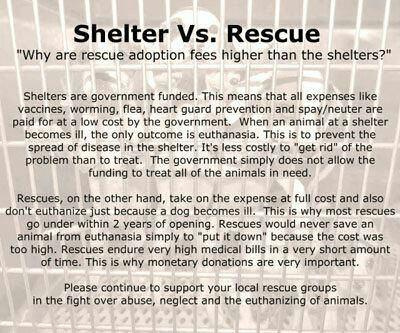 NWGSR is a federally-registered 501(c)(3) nonprofit organization, so adoption fees may be tax deductible in some cases. Adoption fees are payable by check (preferred) or online via credit card. We will also bring you all paperwork and veterinary history we have for your new dog. All healthy, mature pets are altered, up-to-date on shots, and micro-chipped prior to adoption. Puppies and other dogs with health issues will also be charged a refundable spay/neuter deposit, to be returned to the adopter after the dog is altered. Details and a contract amendment will be provided at the time of adoption. Step 10 – Optional Post-Adoption Follow-up Visit - Our adoption contract contains a clause that allows one of our volunteers the ability to perform a follow-up visit. We want to make sure everyone is adjusting well, and help you to iron out any problems should they arise. Our goal is to place dogs into loving forever homes. NWGSR deeply supports its adopters - you are not alone! We are committed to the life, health and well-being of every dog we place for the remainder of that dog’s life. If at any time you are no longer able to keep and care for your adopted German Shepherd, the dog MUST be returned to Northwest German Shepherd Rescue. This is part of the adoption contract that you will sign. There are absolutely no exceptions. Through adoption the dogs become yours, but they are under our care for life. If you've made arrangements for a family member to take your NWGSR-rescued dog should something happen to you, we thank you for being so responsible. However, we still want to know where our dogs go, and follow up with them accordingly. Lost or Stolen - Adopters must notify NWGSR IMMEDIATELY if a rescue dog is stolen or lost. We have a huge base of volunteer and social media contacts, and a search team in numbers is what matters most. Your dog will have a much better chance of being returned to you if you contact us right away. Please remember - your German Shepherd once lived with one of us, and we feel a huge responsibility to him or her. We want to be able to help them return home to you as quickly as possible. Finally, and most important - we ask that you treat your new German Shepherd as a member of your family. These rescued dogs need a lot of love, patience, leadership and understanding throughout this very stressful time of transitioning from one home to another. Remember that they don't get a choice about where they go. It is up to us as humans to make their transition as easy as possible. If you have any questions or comments about our adoption procedures, please feel free to drop us a line at info@northwestgermanshepherd.org.